Shop our selection of wide format media for laser / LED / Xerographic printers. The Topaz brand of engineering CAD paper media has been a recognized symbol of quality, service and innovation for architects, engineers, and designers. We stock one of New England's largest inventories of engineering paper for well-known brands of wide format copiers and printers such as HP, Ricoh, Canon, Xerox, Oce, Kip, and more. 20 lb. Opaque Bond: RollsTyvek Banner is a waterproof, 10 mil tear resistant banner material with matte coating. The image side is coated with a universal coating that is designed to work equally well on piezo and thermal inkjet printers as well as being compatable with dye and pigment inks. 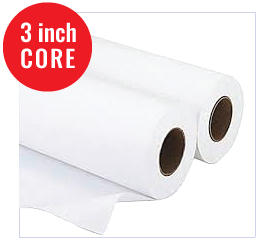 24 lb.Presentation Bond Rolls - 3" coresShop our selection of wide format media for laser / LED / Xerographic printers. The Topaz brand of engineering CAD paper media has been a recognized symbol of quality, service and innovation for architects, engineers, and designers. 4 mil Xerographic Erasable Film / MylarTrue xerographic, laser and LED quality, designed specifically for engineering copiers and LED or laser plotters. Our 20 lb. bond is bright white for strong visual contrast and is manufactured to control curl and static. Opaque Bond is economical, not archival and sheets are corner notched for convenient processing. An excellent choice.